You may know Andrew Fagan from his days fronting 80s band The Mockers, or perhaps more recently his radio show on Radio Live with wife Karyn Hay. What you may not know, is that he is a sailer. He is a mad sailer; mad as the proverbial hatter. Well, there's a fine line been madness and bravery - I guess he may deserve 'brave', as he lived to tell this tale. 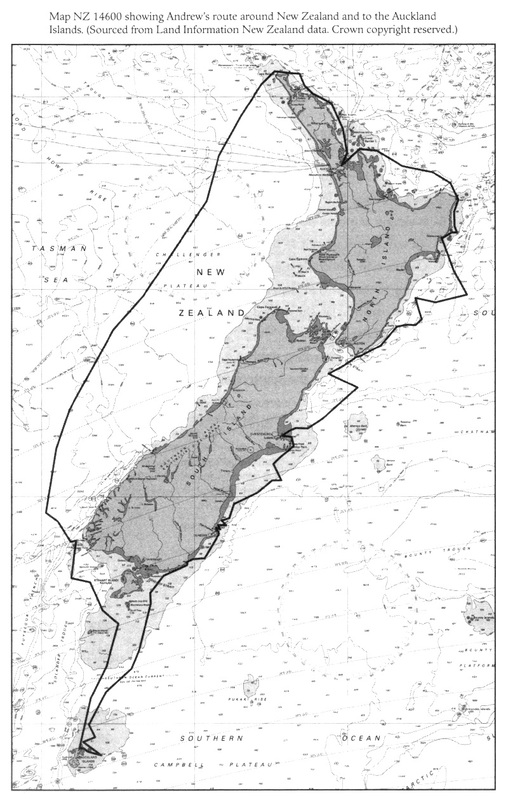 In a sailing boat less than 18 foot in length (with a dodgy engine), he single-handedly sailed from Auckland, New Zealand, down the east coast, then left the relative safety near the mainland to sail to the Auckland Islands before finishing his circumnavigation of New Zealand and returning to Auckland. The Auckland Islands are far enough south to be called "subantarctic", and even summer feels wintery, apparently. The weather and seas can get very nasty. The location associated with this post shows their location on Google maps. It was a seascape I had never seen before. The darkness had sheltered us from a grim and turbulent picture that I didn't realize would look so bad. The waves - seas, swells, call them whatever - were as high as the kauri trees behind where I live my landlubber life in Titirangi. And they were a long way apart compared with other seas I'd seen and had unsettlingly steep sides. Up on the tops of them, where we kept finding ourselves for a brief but exhilarating elevated moment, many were breaking into a cascading tumble of rushing white water. It was obvious even to me that Swirly World had already entered the forbidden zone. As far as I was concerned, there was no need for the tops of these small hills to be collapsing and rushing down faster than the wave itself, and sending a one- to two-metre wall of breaking surf-beach-type water at Swirly World. It looked peculiar, and out of proportion, and it was obvious that we were in what the chart called an area of 'Heavy Overfalls'. Total destruction was a very real possibility as I sat there hand-steering in zero visibility, rushing downwind, aiming for a lee shore 6 miles away that I couldn't see; and listening in awe and fear to the breaking white-water wave-tops manifesting around us in random, vicious, unpredictable shapes everywhere. This was dangerous sailing, with the prospect of it getting worse the closer we got. The scale of waves and white water was enough for me to understand that a somersault could be on the cards if the seas got steeper and those malevolent, rushing bits that better belonged to a surf beach got any bigger. With my survival suit on and thinking thoughts of survival, I turned Swirly World to port and the southeast, reluctantly away from where I really wanted to get to. It had to be done. To get out of here as quickly as Swirly World could sail. It was a beam reach (wind side on) that was required. The storm jib had been driving us more or less before the wind, its tiny square footage just enough to put some fast miles in without any effort on my part. But now, on a beam reach, it didn't feel that efficient. That tiny piece of sail area hoisted on the forestay on the bow was dragging us more sideways than forwards. It wasn't a welcome realization, but the longer I sat there steering, the more I could feel the lack of forward, efficient sailing and, more importantly, could imagine in a macabre way Swirly World ending up on North East Cape, still pretending to sail on a reach but going downwind at a terrible rate of knots. Setting the storm trysail was the answer; get a bit of sail-plan balance. Just before I convinced myself I had to do it, a decent breaker came rushing down the face of one of the tall waves to windward of us and slammed into the side of Swirly World in a frenzy of fast-rushing surf-beach white water. The broken water was running down from the top of the wave, and higher than Swirly World's deck. Up we went, elevating fast, picked up above the sea we had just been floating in; then matter of factly slammed down and shunted sideways, with water half a metre deep over the dinghy strapped down on the fore-deck. The cockpit was full, with me up to my elbows in sea water, holding on grimly. The breaker spun Swirly World round and left us facing downwind, pointing back in the direction of Enderby Island. It was almost like the sea and wind were insisting we go there. The wave-top rushed on through to leeward, then disappeared amongst the others downwind as we quickly lifted up high again on our aquatic elevator, to be smacked by another big breaking one. Swirly World felt a bit helpless in the lee of the hills, and when the white stuff came tumbling down fast with no intent to stop, you knew what was next. It was scary sailing now. These had to be the mythical overfalls extending out from the coast further than I expected. Mr Fagan writes with a relaxed enjoyable style. Hats off to him for his mad/brave adventure and being able to put it down so well on paper. 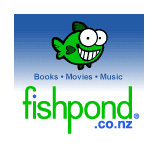 View the book on fishpond.co.nz or the kindle edition on amazon.com. The Wairau Bar seems to be inconsistent with the kahawai. 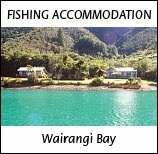 Tony Orman has mentioned in the NZ Fishing News magazine over the last two months that "Kahawai are showing up spasmodically", and "... they remain erratic, with some days great and others being inexplicably blank." My recent experience backs this up. I've only been down there twice recently - the first time yielded nothing, and the second time was as good as I've seen down there. Many nice-sized fish being landed by fishers. The healthy fighters put up a great battle in the current - my line on the reel I used first must need replacing, and after losing the two best lures I had on-hand before upgrading to a bigger reel I had with me that had new and stronger line, my smaller backup lures were then the reason for losing fish, with the hooks getting straightened out. I did land one nice kahawai, though. The water is getting quite clear now in the Wairau River. 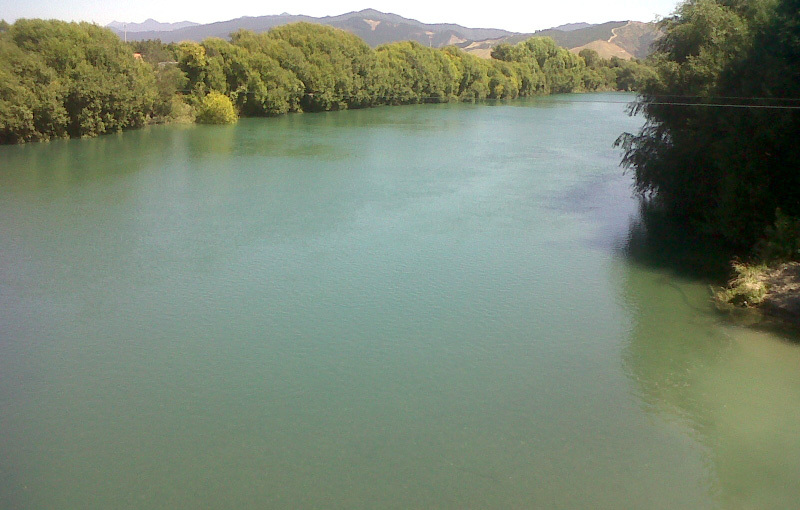 Wairau River, looking upstream from the Ferry Bridge, near the Spring Creek township.